In January, I was lucky enough to visit Kamchatka for the first time in my life. Neither the nine-hour flight, nor advice to “pack every piece of warm clothing you have” could deter me. While my friends and colleagues were worrying on my behalf, I’d already packed my bags in anticipation of an exciting journey. The symbol of Avacha Bay, the guardians of the port towns, and an officially protected natural monument. The Three Brothers cliffs are one of Kamchatka’s most distinctive landmarks. 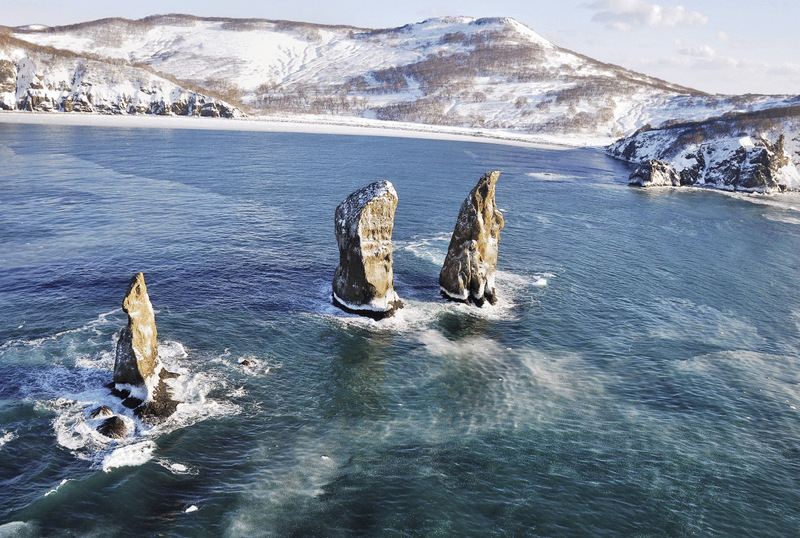 Located right at the entrance to the bay, they have been a famous sight since the 18th century, and were first marked on a map of Avachinsky Gulf in 1737. I had excellent company. 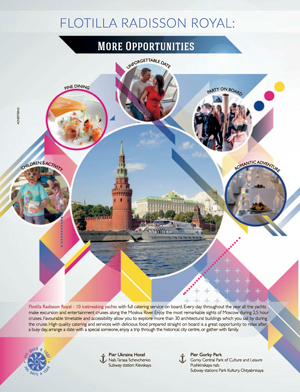 The group of over 60 people consisted of managers and staff from the major tour operator TUI Russia, other travel agents, and officials from government tourism agencies. 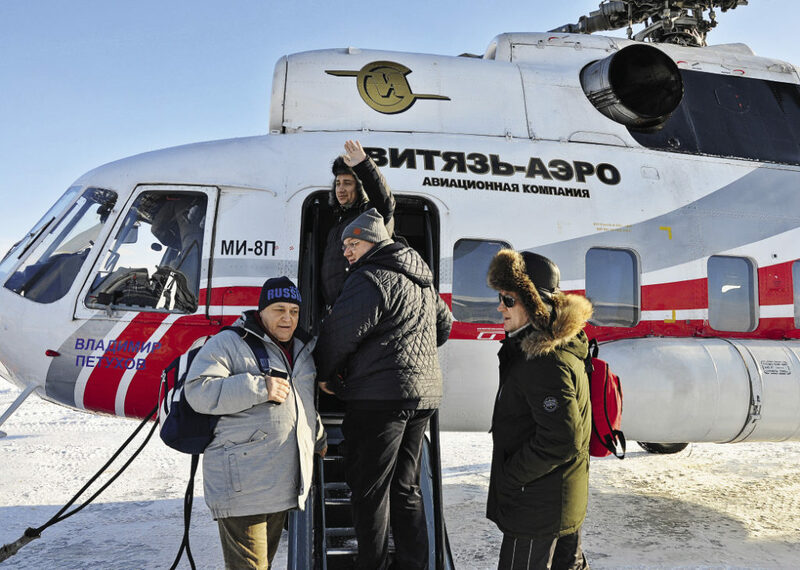 Our visit had been carefully prepared, with the support and active involvement of the regional government and Kamchatka’s tour operators, who together had organized this business tour with the title “Kamchatka – Winter Adventures”. Vityaz- Aero has a monopoly on helicopter flights on the peninsula, with 30 Mi-8 helicopters and its own heliport. We stayed in Bel-Kam-Tour Hotel, in the resort and spa district of the village of Paratunka, 40 minutes’ drive from the regional capital. For guests from Central Russia, the most unusual feature of the hotel were the four outdoor pools with thermal waters at a temperature of 36-37ºC. The water flows into the pools from the hotel’s own 1600m borehole. When it’s -5ºC outside, with snow lying all around, you can float in the pools and gaze at the starry sky above you – it’s fantastic! Rooms at the hotel start from $110 for double occupancy per night, and there are also separate bungalows. Rates are roughly the same at the Avacha Hotel in the center of Petropavlovsk-Kamchatsky, where we spent the two final nights of the trip. 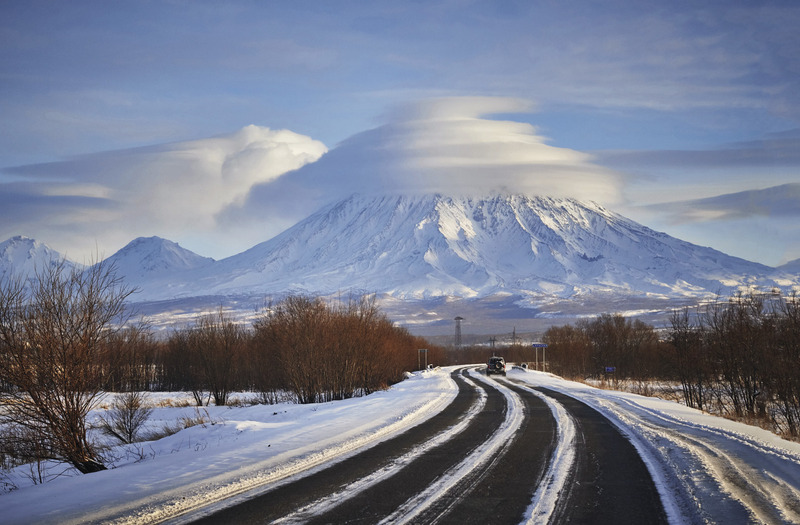 The active Avachinsky Volcano is located 30km from Peteropavlovsk- Kamchatsky, and is climbed every year by thousands of tourists, thanks to its accessibility and relatively simple ascent. The base of the mountain can be reached by all-terrain vehicle. Another peculiarity of a trip to Kamchatka is the jet lag. Due to the change in time zones, we were all waking up regular as clockwork at 4am. 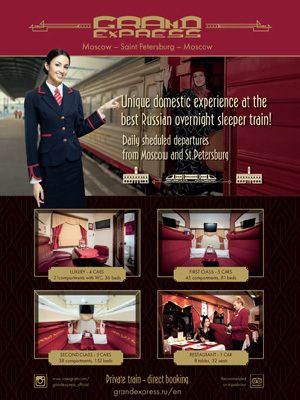 For me, this continued to be the case when I got back to Moscow. For about a week afterwards, I woke up at the same time and couldn’t get back to sleep again. 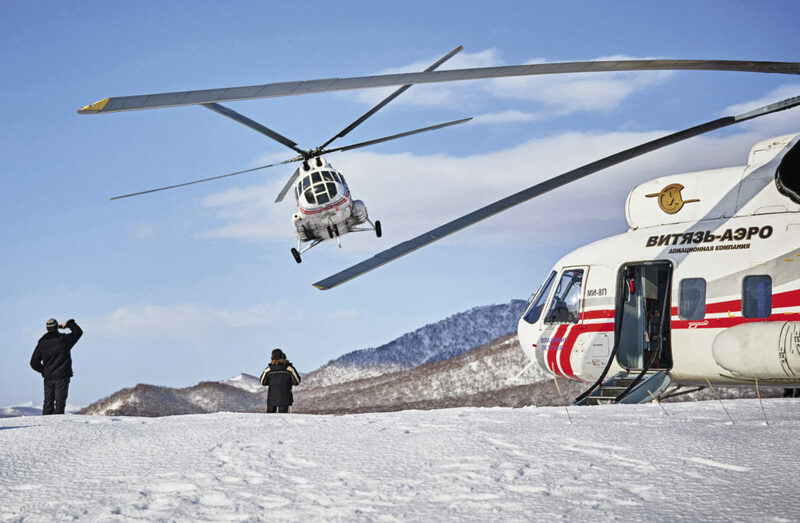 A helicopter flight over the volcanoes is one of the most memorable Kamchatka experiences. On the next day, we were taken to the Avachinsky Volcano, which is situated just 30km from Petropavlovsk-Kamchatsky and is the most popular of the peninsula’s volcanoes with tourists. The roads to the volcano aren’t passable by car, so we were transported in snowcats – big trucks on caterpillar tracks. Most of the group then transferred to snowmobiles pulling narty (long sleds). This was where the need for warm clothing became apparent – on the open slopes the wind whips straight through your coat, and we had to cover our faces with ski masks and goggles. 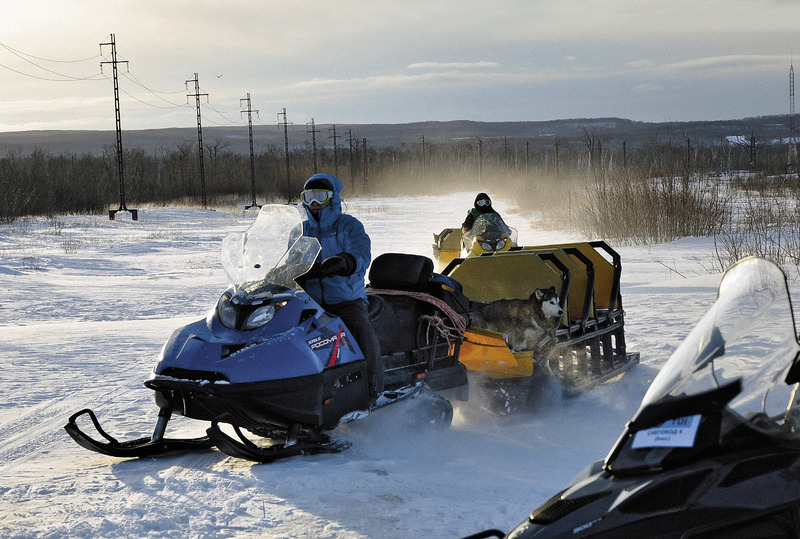 We reached the base of Avachinsky Volcano on snowmobiles towing narrow sleds, or narty as they are known in the local language. Frequent changes in weather on the peninsula make exact planning impossible, as was proved that day when a storm blew up that stopped us from reaching the peak of the volcano. We did, however, manage to get to the base owned by Alpika and Kamchatintour, where there was a delicious hot lunch awaiting us. Water flows into the pools from a 1600m borehole. With snow lying all around, you can float in the pools and gaze at the starry sky above you. That day we managed to reach the Alpika and Kamchatintour base, where a delicious hot lunch was awaiting us. The guest houses where travelers sleep summer and winter are very basic – rooms for 4-6 people with bunk beds and toilets in the yard. The electricity comes from a generator, and there are no roads. Tour managers are confident that if the government can get utilities out there, the conditions for tourists will be a little less spartan. Businesses are eager to develop the site.On that note, Kamchatka really has a lot of snow. The depth of snow cover in the mountains reaches as much as 20 meters, and it stays till July, so there’s a lot to offer downhill skiers. On the following day, we had a helicopter tour. Take-off was delayed by an hour due to the weather. At the heliport we found ourselves alongside travelers waiting since morning for flights to the north of the peninsula, which can’t be reached any other way. The company Vityaz-Aero, the only operator in the area, boasts a fleet of 30 Mi-8 helicopters with experienced pilots, and built the heliport and terminal itself. Helicopter tours are organized by Vityaz-Travel, and an hour-long flight around the volcanoes costs roughly $320. During the day, we got a bird’s-eye view of the Avachinsky, Koryaksky, and Zhupanovsky volcanoes, as well as the famous Three Brothers cliffs – a landmark of Avach Bay, where we made a landing on the beautiful shores of the Pacific Ocean and got the chance to take loads of stunning photos. Perched on the ridges of ice were endangered sea eagles, while right on the deck we were serenaded by Vasya the sea lion, who jumped out of the water. Yet another adventure came with our boat trip on the Almaz motor vessel. Due to ice swept into Avacha Bay by the wind, the boat couldn’t get out to sea on its own. A tug had to be found to clear a path and guide the Almaz out of the bay. Even so, we were still unable to reach our final destination, but we did get the chance to have an excellent meal – the menu included caviar, fresh seafood, and an exceptional ‘ukha’ fish soup. Heading out onto deck, we were able to enjoy extraordinary views of the ocean shackled in ice and a dimming sun setting through the clouds. Perched on the ridges of ice were endangered sea eagles, while right on the deck we were serenaded by a Stellar sea lion we christened Vasya. He jumped straight out of the water with a fearsome roar to beg us for fish. Eagles and sea lions can only be seen this close on winter sea cruises. In summer, the sea lions move hundreds of kilometers from human habitation, while the eagles perch on their nestswhich they rarely leave, and can therefore only be seen with powerful binoculars. Interestingly, when we fl ew out, the bay was clear again without a single piece of ice. Th at goes to show you how quickly weather can change in Kamchatka. Anna Prokopyeva from TUI Russia helped organize our group, and stoically suffered the frost, wind, and other discomforts alongside us. Our third day proved no less interesting. We visited the Kaynyran ethno-village (in the Koryak language, the name means “bear corner”), where there’s a kennel for sled dogs. 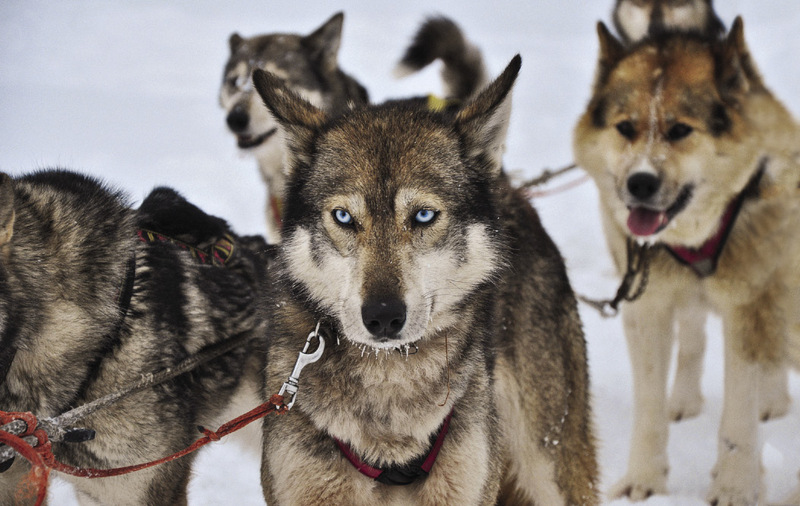 Here they keep more than a hundred dogs, both huskies and the local Kamchatkan sled dogs. 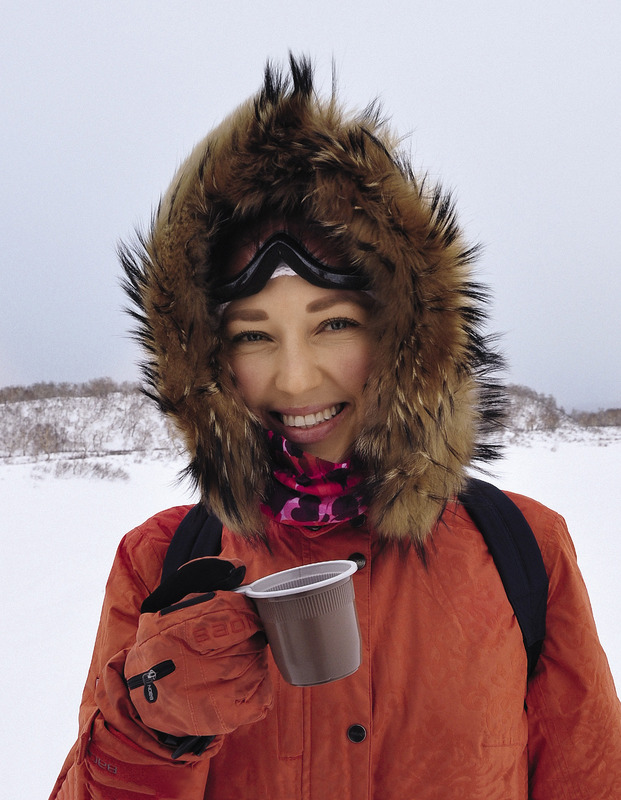 We went sledding with dog teams and were fed shurpa with hot tea made from Kamchatkan herbs in a traditional yaranga – a reindeer-hide tent. A Koryak ensemble performed a vibrant mix of songs and dances for us. In their tradition, they represent diff erent animals and birds in their dancing, while the favored musical instrument is a shamanic drum. 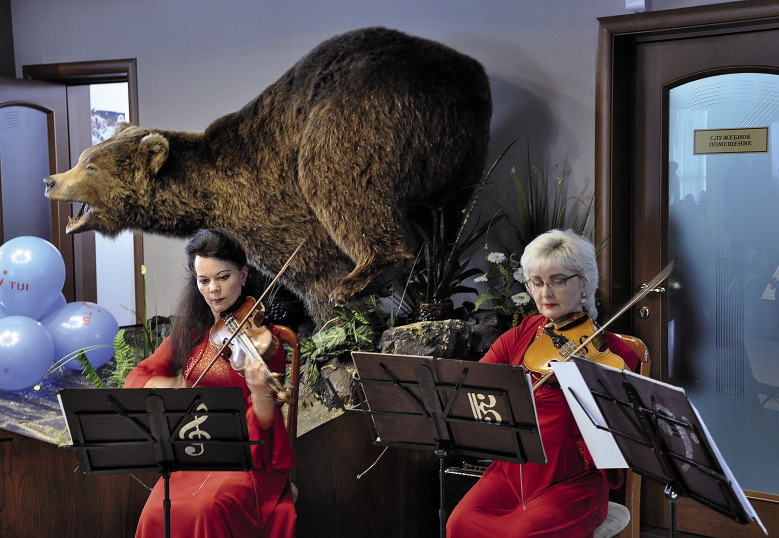 At the Bel-Kam- Tour Hotel we were met by an orchestra from the Kamchatka Philharmonic. The sight of the musicians with a large stuffed bear behind them made a lasting impression. Two other groups from our party were introduced to the traditions and lifestyle of the indigenous peoples of the peninsula at the Children of the North community project, before visiting the Snow Dogs and Kamchadal sled-dog kennels. 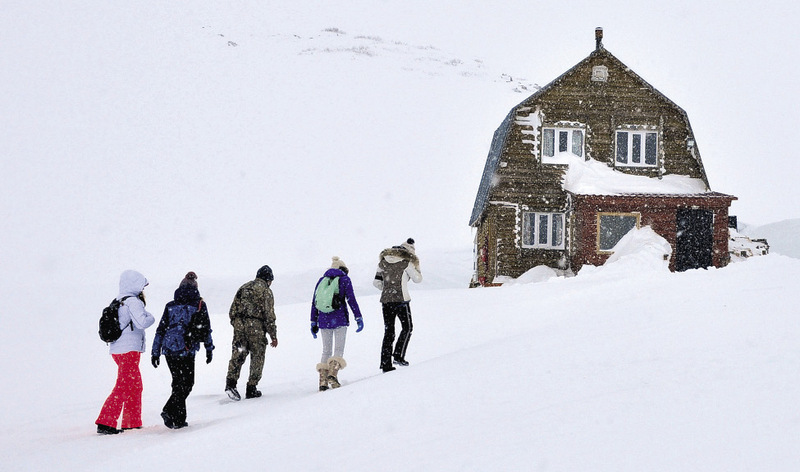 At the Kaynyran ethno-village, we were taken dog-sledding and fed shurpa with herbal tea. 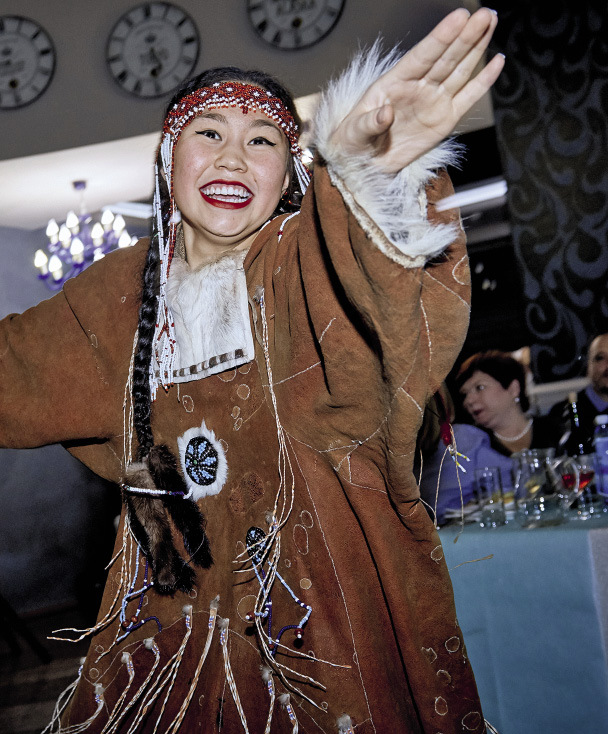 A Koryak ensemble performing traditional songs and dances. In their tradition, they represent different animals and birds in their dancing. One more place that can be thoroughly recommended for travelers is the Volcanarium interactive museum of volcanoes in Petropavlovsk-Kamchatscky. Th ere you’ll learn just how interesting volcanoes can be, with explanations of what you’d see if you found yourself inside a real crater, you’ll take a tour through a lava cave and witness live experiments with fi re and crystals. As a souvenir, you can take home a little piece of volcanic lava. 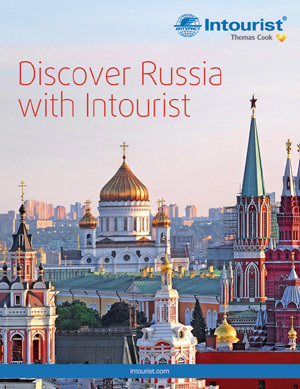 The only way to reach Kamchatka is by air to the regional capital, Petropavlovsk-Kamchatsky. Yelisovo Airport is situated 30km from the city. Reserve, which is only accessible by helicopter. If you want to see bears in their natural habitat, head for the South-Kamchatka Wildlife Sanctuary around Kurilskoye and Dvukhyurtochnoye Lakes. quite unusual for European tastes. A local market is an essential stop for all visitors, to buy fresh red caviar from Atlantic or Chinook salmon, and mouthwatering smoked fish – sockeye, chum, Coho, and Chinook salmon. A kilogram of Chinook salmon caviar costs $58, while the fi shitself goes for around $17. Another popular local delicacy is Kamchatka king crab.